Please take a moment to read some of the letters which subscribers have written to us, and see what their experiences have been like in penny stocks! I will make this very short. I want to tell how much me and my investment group really appreciate your insight and your wisdom. I am the President of a minority owned investment group with 43 investors total. Our Company has made hundreds of thousands of dollars in the stock market because of your wonderful Leadership and your awesome perspective about the market. I really want you to know how much I love your humility and the way you teach and make everything simple for anyone to understand. Before I knew about you Peter Leeds, I struggled greatly in the stock market. But when you're exposed to someone and something greater than yourself I guess you have no choice but to succeed. By applying all of the principles and reading your info our company made over a million dollars in less than a year in the stock market. I learned so much before I even subscribed to your website. Now I can't believe how much money I am making thanks to you. I will be forever in debt and thankful for all you have done for me and my investment group. 1. Because of you Peter Leeds, my company has helped single moms keep from filing bankrupcy. 2. Because of you we have been able to help our investors get rid of bad debt with high interest rates. 3. We have also helped people that can't pay their car notes. 4. Most importantly we have been able to take what we have learned from you and educate or community about not being a consumer but an investor. Peter, I would love if you could come this year and speak to my investment Group. What would it take to get you to come to Texas and how much would you charge us? I am the same age as you and I started day trading at 25 years old. I discovered your website right before I turned 30. It took me a while to subscribe, but thank God I did. Me and my investment group love you so much, and thanks for being such an awesome voice instead of an echo in the stock market. Keep up the good work. Churches really need to hear what you are teaching. I find that church people need so much help in having a balance in the spiritual and the natural. Thanks man, sorry for writing you a book report. As a 3rd year subscriber I felt it was time to thank you for all the help you have given me in my trading endeavors. In fact, you are the guy who got me started. 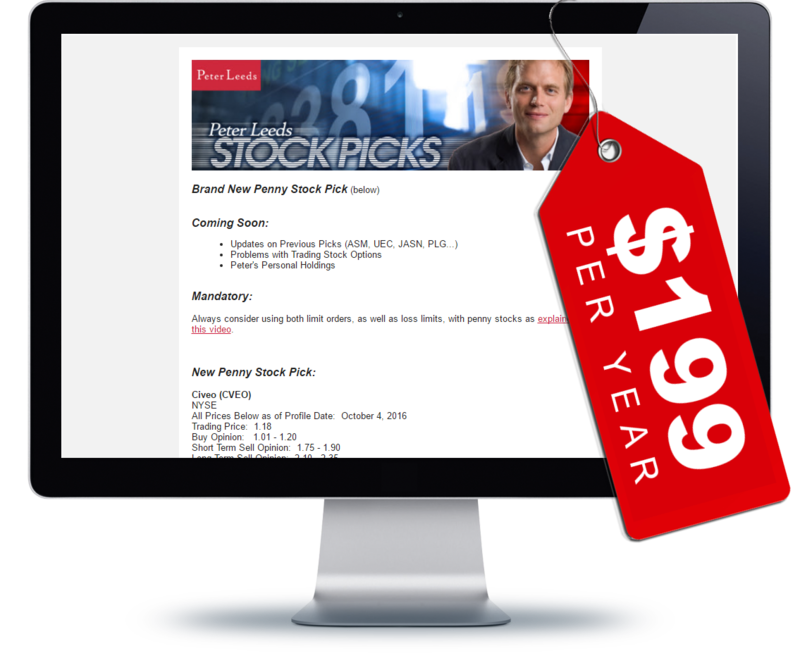 I never had much interest in the stock market until I saw your free online book. At the time the job situation here in Upper Michigan was pretty bleak as usual. So I read your on line book. Then I read it again. I loved it so much I tried to print it out with no such luck. So then I read it again and this time wrote the whole book out longhand. All the while hoping to see it one day put in regular print. I bought my first stock in October and to this day have bought 18 more. I have made 13 completed trades losing money on only 2 of them. The 2 losses only totaled to $22. My average profit margin last year was 12.5%. So far this year I have completed 6 trades all in the money with a 23.5% profit margin. As of this time I am holding 6 stocks. My goal is to eventually buy my shares in lots rather than in hundereds in order to capitalize more on a smaller percentage move. The funny thing is that out of all of my buys only 3 of them were your own picks. The rest is my own due diligence. That's what you taught me right? So that's what I'm doing. You have trained me to spot stocks that will go up, not down. My not using many of your picks should in no way be perceived as a reflection of you. It's just that I don't want anybody holding my hand as I venture through this financial jungle called the stock market. I must learn to stand on my own two feet resting on nothing but DUE DILIGENCE! The truth is Peter that I think you are a brilliant economist! I read and printed out both yours and John's articles as you write them. You are more than just another stock guy to me. You seem like a wonderful person and I'll bet you have a wonderful family who loves you very much. I have prayed more than once that your health problem be gone and that you and your family know Jesus Christ as your personal savior! For he has used you as a great blessing in my life! Thank you Peter. May God bless you and your family more than all the money in thts world ever could. Thanks Peter. I really wanted to express to you personally how enthused I am by your program. I have been waiting for something like this program for a long time. I have a very keen interest in investing and have been managing my husband and my portfolio quite successfully over the past 10 years. I have now found myself in a position where I am no longer satisfied making 7-10% annually. I've dabbled in stocks, but with little success. After spending time reading your material and doing some more research I feel comfortable enough to make some wiser choices. I am truly excited about the future potential for our investments. I especially appreciate your Stock Picks choices. It not only takes the guess work out, but it really reduces the amount of time I have to spend doing research. Your expertise is a wonderful time saver and puts me 90% there instead of starting at ground zero. We are now allocating 10% of our portfolio towards this endeavor to start and with more experience will grow from there. Again thank you and I look forward to being part of your program. How are you? My name is Athanasios Bouchoutsos and I just want to let you know that I never knew it was so easy to make money on the stock market. That is because of you, you have simplified and revolotionized investing, and I would like to thank you 100 times over and over again, thank you Peter! I never knew or imagined a 25 year old like myself would make this kind of money, thanks a million. I also want to let you know I read every single page of your book and I love your book and found it very informative, interesting, and fun to read. Your book has been very infomative and very lucrative because I feel now by taking in all this knowledge it's just too easy too make money on the market! Thank's again. If someone told me Peter Leeds is coming out with a new book and I have it right here in my bag, but I also have $5000 and I had a choice to pick only one of the two, I would choose your new book. Thank's Peter for simplifing investing. I also want to let you know, no disrespect or anything to you, I love your Hot List, but I don't use it. I use my own Hot list! What I use is your teachings from your book that have been very profitable to me. I never knew it was so easy to make money, and I believe anyone could do it. Bye now Peter, you've changed my life, thank you a million times, you have a wonderfull day and God bless you. I just wanted to let you guys know that I have been a subscriber for about two years now. For the first year, I did not do any trading, even though I wish I had. Instead I studied your stock suggestions and watched where they went. I also kept note of any potential stocks that I found interesting and kept a watch on those as well. I finally made a move last summer and I bought NWD. As luck would have it, about two weeks after I purchased the stock, it announced a deal with Coke and off it went. The stock more than doubled, allowing me to sell half and use that money to invest in another stock pick of yours. It has become a great and fun habit to visit your web site and learn about these small companies I would otherwise never hear about. What a great idea and a great business you have started! Thanks, and as long as you guys keep giving me ideas, I'll keep buying! I want to thank you for your service; I consider the cost a great bargain. After almost a year of paper trading, I launched out for real with a modest investment amount and am pleased with my first year in this new activity I now call my new hobby. My account as a whole increased 39%. My first thrilling stock sale was from NWD with a realized gain of 220%! My best stock is HOM, donating a third of those shares for charity at a 314% gain and have decided to keep the remaining shares around for a while longer as I figure it will go up some more - I'm surprised you haven't featured (i.e. boasted about) HOM in your daily updates for quite a while with the fantastic gains it showed. My very first trade I made a 20% return. Exactly what I expected out of it from fundamental/technical analysis and it's still climbing. My second is just around the corner I'm looking at a 35% profit on this move. This may seem insignificant to you. But I feel if I can turn $300 into $350 in one week then I will become a millionaire shortly. The point of this message is I want to thank you for taking out time to educate your followers. I was a little skeptical at first. Then I thought to myself that rich people are rich because they analyze, not criticize. I am a subscriber to your website, but I value more your knowledge and education than simply telling me what to put money into, although most people would prefer the latter. I am ready and waiting for more education and have an extremely open mind towards knowledge. I am curious though about your employees. Do you train them personally? They live in all different states I heard. How does this work out? To become the best I realize I have to be associated with the best. So please keep teaching me any personal advice or simple tactics, please feel free to share with me anything at all by e-mail or phone. I have a mind waiting to be molded and a dedication to myself to become the best penny stock investor. I lost some money following other penny stock recommendations sites. I am new with your service but I bought one of your recommendations and in three days I have doubled my money. Every week I try to buy one of your choices. I found your site in today's Barron's article. Your web site looks great and it is always nice to see that someone takes the time to research companies without having a banking relationship at hand. Because of your company, I finally made some money on the stock market. I feel like I'm almost in shock. I am new to investing and have been buying and selling stock for about a year. I have owned about 20 stocks, and lost money on 19 of them. I've had a very consistent investment plan - Buy High and Sell Low. I wonder why my method wasn't working. Thank you, thank you, thank you, thank you, thank you for your company. Just wanted to say Thanks for the membership, more importantly thanks for you alls time and labor that you all have put into the website... without all the hype... Thanks. Thanks... Thanks... Thanks... I wish I would have found you guys before I sank my money into one of Arthur Andersons clients...(WCOM) WorldCom. Lesson learned... you move on... moved on to Peter Leeds. I am a fairly new customer, and bought a subscription for 2 years, and already I am VERY pleased with the result. My first trade was in IDEV at $0.96, which I sold out at $1.70, you can do the math :-) 10 days later. This trade put me in a very nice financial situation for accumulating my new trades, this is a big THANK YOU, I will recommend you to anyone I know. (You are welcome to post this if you like). I became a new member on July 11th & signed up for your 1 year subscription. After experiencing the service you provide, I am very impressed. I was also further impressed by the timely responses to my e-mail questions. One of my questions was even answered on a Sunday morning which I never expected. Therefore, I was wondering if somehow I could increase my membership to a 3 year membership by paying the difference? You remind me of the saying "Give a man a fish; feed him for a day (your weekly stock picks). Teach him how to fish; feed him for life." (your willingness to respond to e-mails and your other teaching methods). Just wanted to say "Thanks!" Since starting with peterleeds.com aprox. 3 months ago, I had a 109% cash gain to my account, this by following the stocks closely and following (not all) but most of your advices, keep up the good work! Also I realize the gain was made in troubled time for the nasdaq and world wide stock market, so I am impressed. First of all I would like to say you are doing a great service to beginning stock investors like me. I have been a member for less than 2 months and using your service I have made some good gains on the market. Just would like to say I started with $1000 in my E-TRADE account & I'm over $4000 just a few months later and would have more if I would have just listened to your advice more. I'd like to say "Thanks and keep up the good work!" Your site will more than pay for itself. I've been very impressed with your stock picks once I put them into a portfolio, seeing above 50% gains for the entire portfolio. And with just one stock "losing" and little at that. Very impressive. You guys have a great knack for finding penny stocks that are financially sound. One stock that you noted, was Tesoro Energy which I recently bought last week. This week, and particularly today, it's up over 140%! Since subscribing in June my small portfolio has increased by around 1000% and I did not trade it for two months because of holidays. I'm extremely pleased with the research you've done. We're not dealing with fly-by-night Internet stocks here. On all transactions, so far I'm averaging an 88% return. Keep up the good work." I started out with $1400, at Christmas I had $3900. THANKS! This was done in a 3 1/2 month interval. Every cent I spent on the membership is more than worth it. Almost 19 times it's value on just one stock that I played.